"Start every day like it's your birthday!" OK - So it's pancake time! I've had an awful start of the week, so a mini-birthday-Wednesday was in order. I usually plan all my meals for the week on Sunday nights, making all preparations and shopping if necessary. This Sunday I prepared a few OJ&Greek yogurt popsicles and a few other treats to get me through a stressful week. Today's breakfast menu was unplanned, but luckily I always store these ingredients at home. I've tried a lot of different protein powder pancake batters, but I'm still not quite convinced. I really don't like the aftertaste of protein powder, especially unflavoured rice protein. If you've got a decent recipe to share, I'd be more than happy to try it! 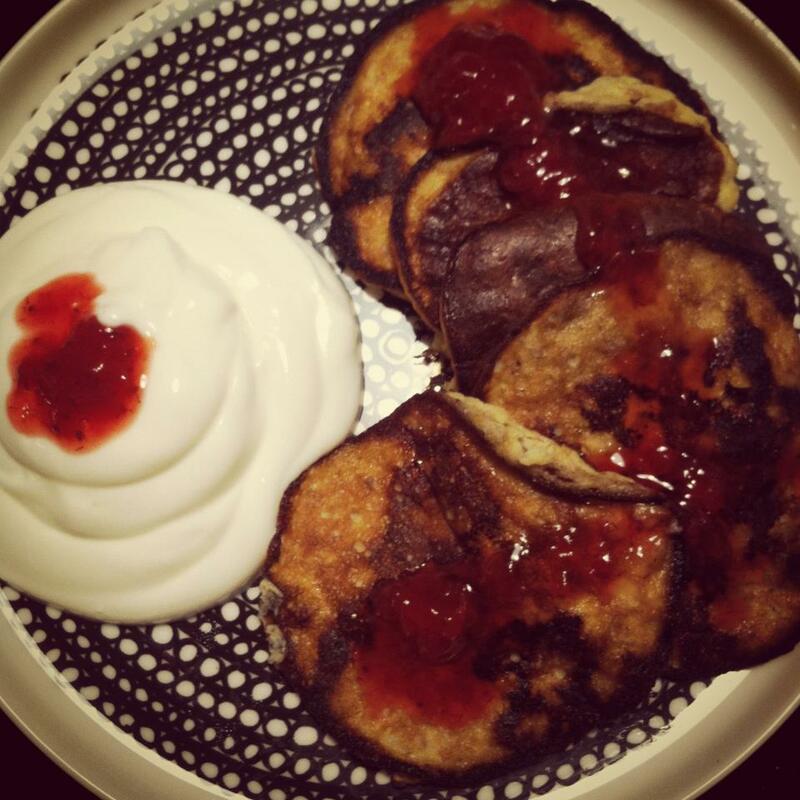 The pancakes are dairy-free, flour-free, sugar&sweetener-free and sooo simple to cook! Step #1: Peel the banana and chop it to small pieces. Preheat a pan to medium-heat. Step #2: Put the banana and the egg in a blender, blend until smooth. The batter should be soft and airy, almost like a mousse. Step #3: Melt the butter in the pan and make four or five mini-pancakes of the batter. If possible, use a frying pan made for pancakes to create prettier (and symmetric) pancakes. Fry the pancakes for a few minutes, until they're golden brown. Turn the pancakes carefully! The pancakes will rise a bit, but after turning them they will fall. So be careful when turning them, you don't want to ruin your perfect ("birthday") breakfast. Step #4: Enjoy! Serve with home-made strawberry "jam" (the strawberries are really sweet by themselves, no thickening sugar needed - I used pectin for thickening) and some Greek yoghurt on the side. Yum! So try this out and let me know what you think! I guess that makes a huge batter for like 6 people, right? The recipe sounds good (although I'm a little sceptical about the potato). I'll try it ! Thanks !